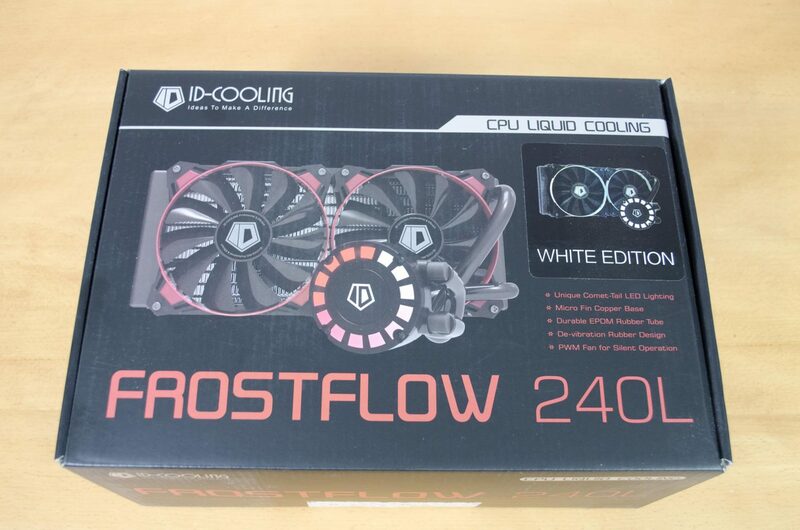 Today, we will be taking a look at the ID-Cooling FROSTFLOW 240L White Edition. 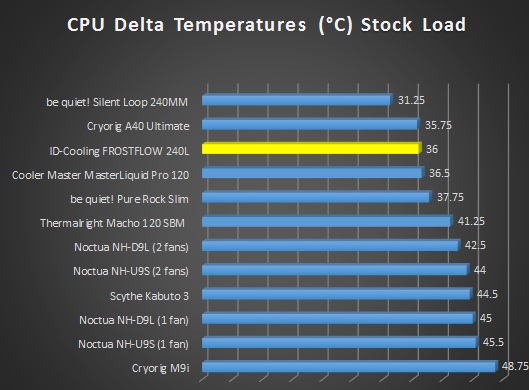 The Frostflow 240L is an AIO CPU Cooler that looks quite promising on paper. 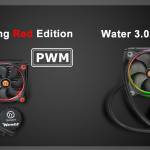 While ID-Cooling isn’t the most well-known manufacturer here in the UK, I have seen a few of their products in the past and have been nothing but impressed with what I have seen. 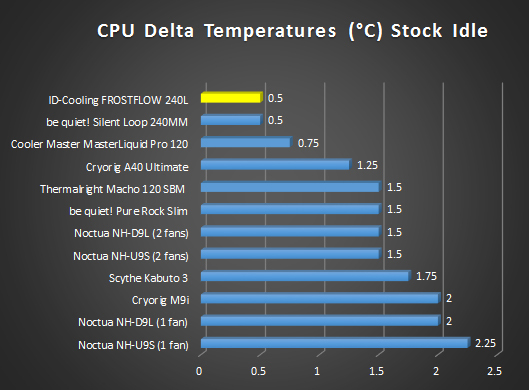 ID-Cooling currently focuses mostly on cooling and cases at the moment. 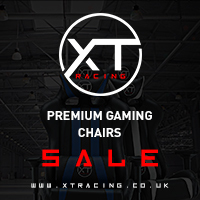 They have a great range of air CPU coolers and fans, alongside some pretty impressive cases like their T60-SFX. 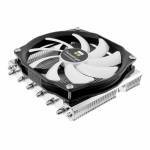 If you are unfamiliar with ID-Cooling, it is well worth clicking the link above and checking out their website, or heading to Overclockers UK and seeing what products they currently stock of theirs. 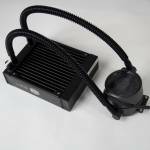 As you can imagine, the Frostflow 240L is a 240mm AIO cooler, which so happens to come in a couple various colours. 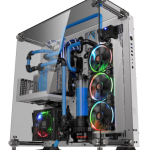 AIO coolers are said to offer the best of both worlds as you can get similar performance to a full custom water cooling loop but without the hassle of having to maintain it all. The Frostflow 240L comes with 2x 120mm PWM fans and even features a unique comet-like LED effect on top of the pump which will be visible should your case have a window on the side panel. The packaging for the Frostflow 240L goes into a good bit of detail about the design and specifications of the unit. 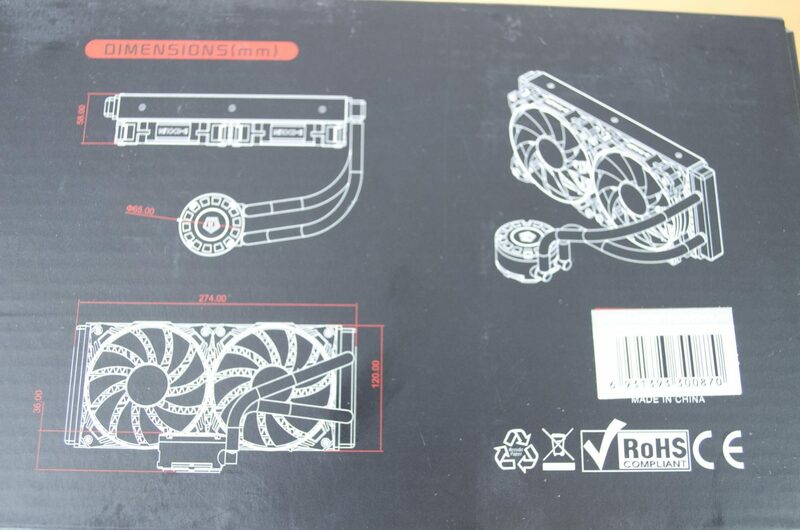 On the front, we can see the image of the cooler, with a sticker letting us know we have the white version for our review. We can also see some of the more sought after features listed on the front. 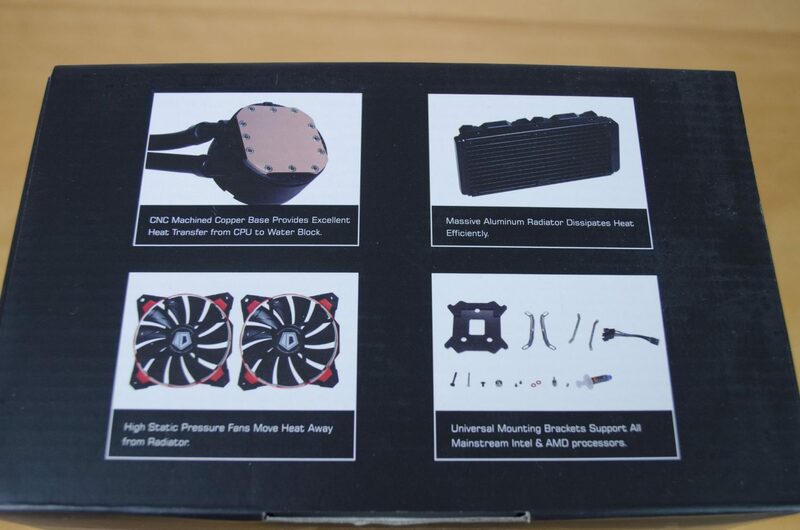 On the back of the box, we have some more images of specific parts of the cooler, such as the radiator and CPU block. 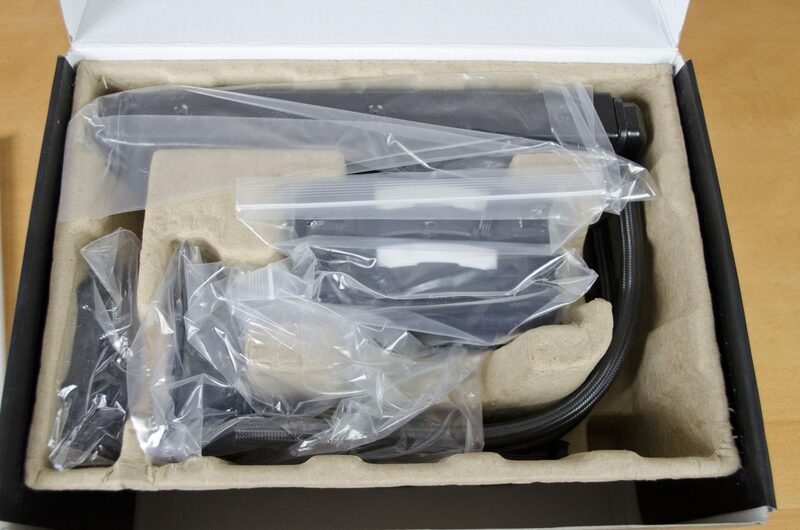 We can also get a bit better look at the fans and the mounting accessories that are included inside the box. 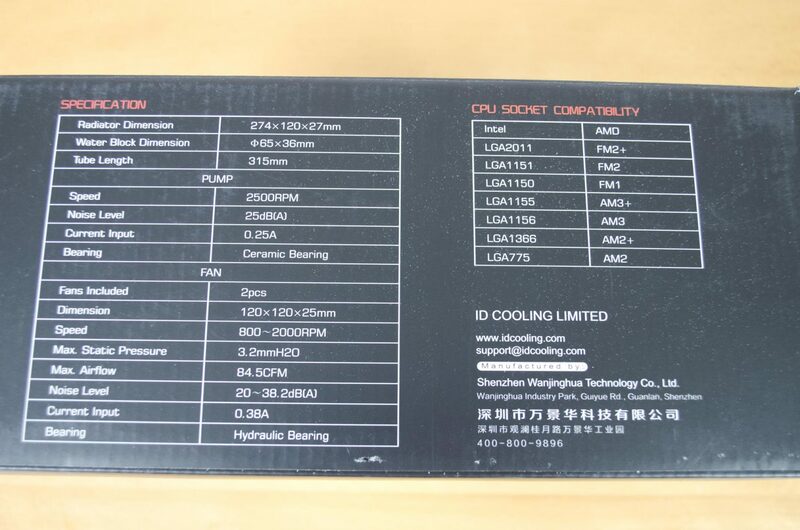 Looking around the sides and we can see a full list of specifications as well as a CPU socket compatibility list and even a diagram showing the dimensions of the unit. Opening the box up and everything is securely packaged and covered in plastic to ensure it doesn’t get damaged in transit. As for the contents, there are 2x 120mm fans, the radiator and pump/block combo and a bag full of mounting accessories for both AMD and Intel CPU socket types. 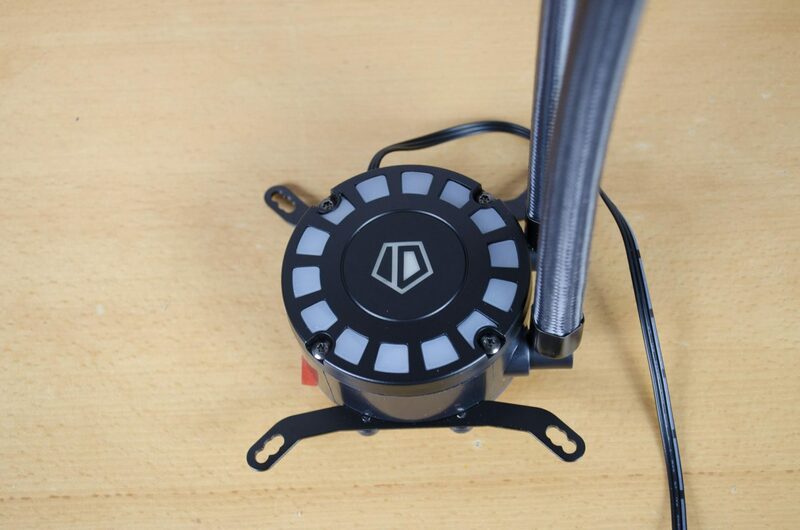 The included PWM fans come with pre-installed anti-vibration rubbers which is also nice. Keeping things as quiet as possible is always a good thing and vibration noises can be highly annoying. 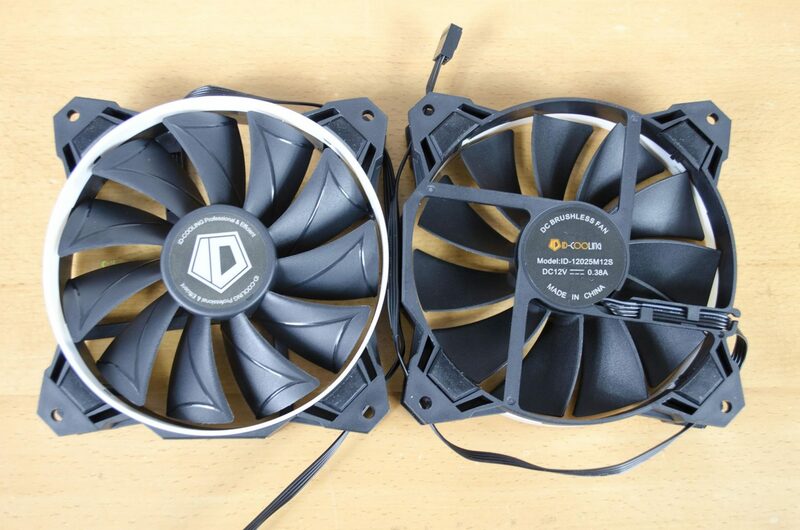 The white rings on the fans are also easily removable and while there aren’t any other colours included in the box, they could be painted if you so desired. 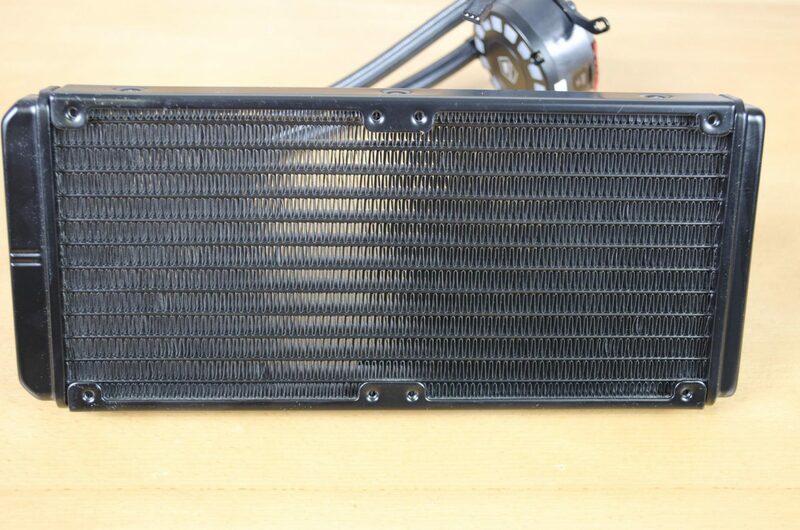 The radiator itself is a fairly standard one we would expect to see on an AIO cooler. 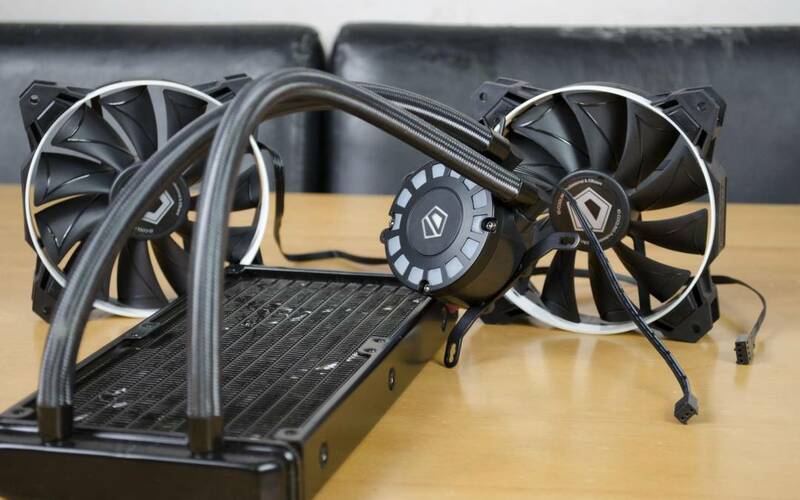 It’s dimensions are 274 x 120 x 27mm so while they call it a 240mm AIO cooler, the total length is actually 274mm so make sure you have that little bit of extra room in your case if you are looking to install this inside. The top of the pump features a circular LED ring along the outside and an illuminated ID-Cooling logo in the middle. 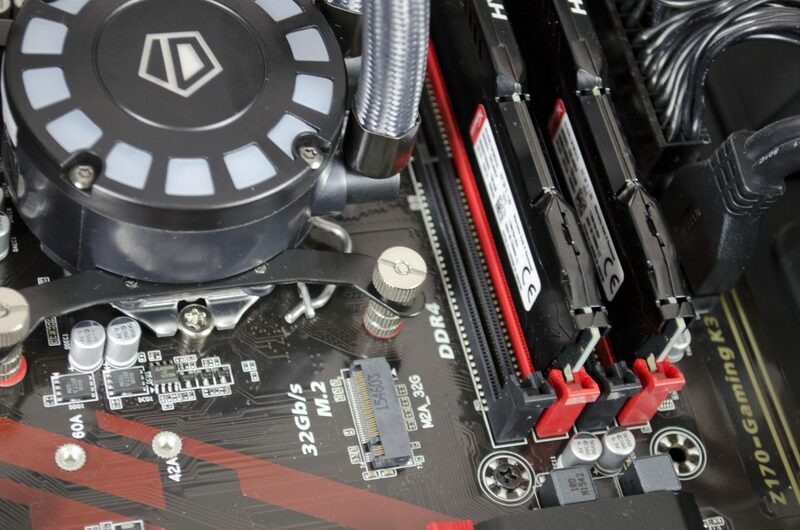 One thing I was extremely happy to see was the tubing connecting the pump to the radiator. 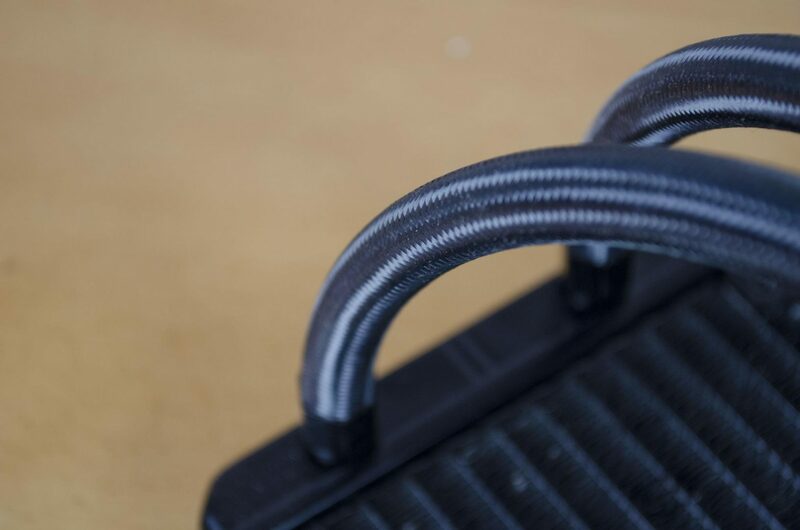 Not only is it fatter tubing than we see on a lot of AIO coolers, it is sleeved which not only makes it a bit more durable, it makes it look 100x better than if it was just the standard tubing, in my opinion anyways. 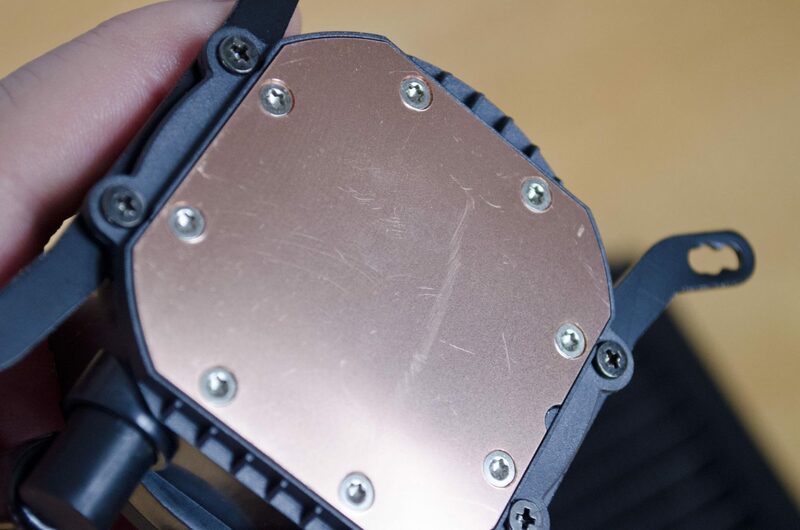 The CPU block is quite big and flat which should allow for plenty of heat to be dissipated from the CPU through to the radiator. While there are a couple of scratches to it, these did not seem to have any impact on the cooling performance offered by the Frostflow 240L at all! 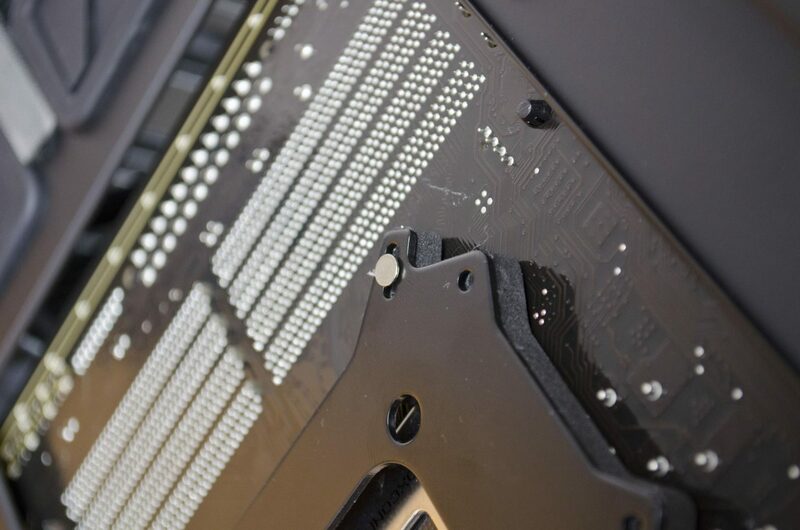 To get things started off and get this mounted on our Skylake test system, we first had to get the backplate attached to the backside of the motherboard. To do this, first, you have to get the correct screw and push it through to the front. Next, to hold it all in place you will want to add one of the little washers and then use the “Knurled threaded nut” to hold everything into place. 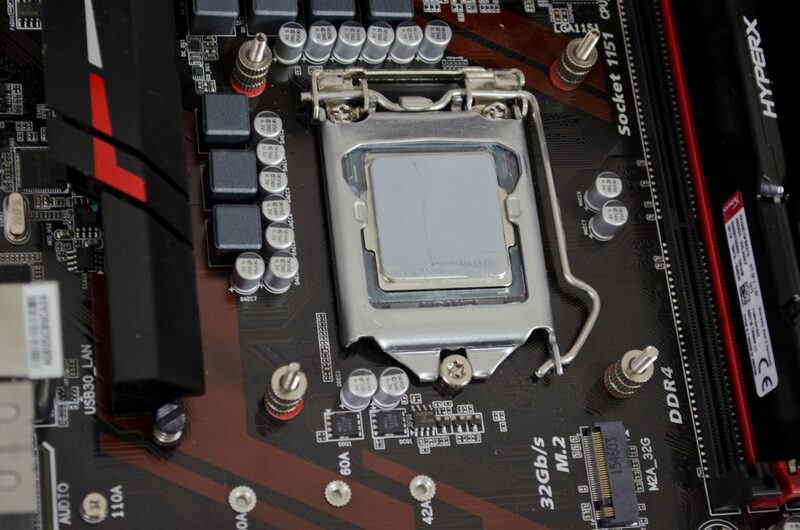 Now it is time to apply your thermal paste. 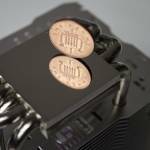 Finally, we can set the pump/block onto the CPU and secure it into place using the “T-nut”. 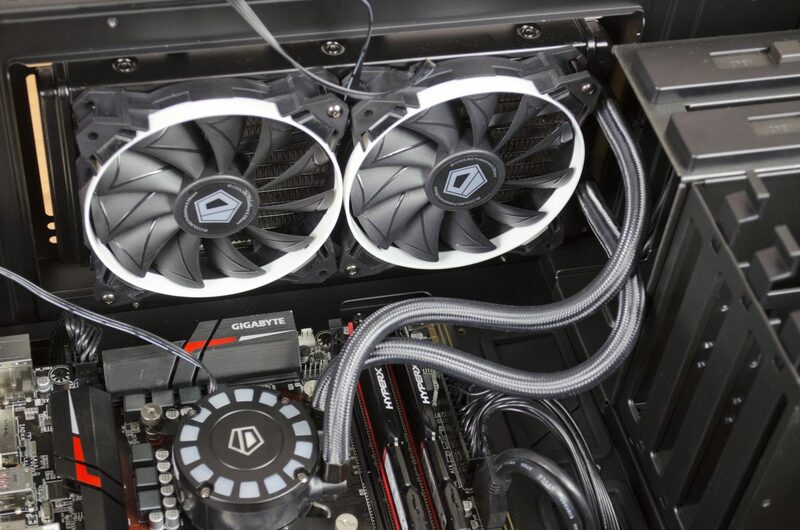 Whether or not you install the radiator or pump first, or put the fans on the radiator before installing int your case is completely up to you. 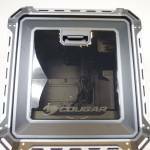 As you can see, in our MasterCase Pro 5, there is plenty room for the Frostflow 240L to fit in the top of the case without obstructing the view of the rest of the build too much. Let’s go ahead and get the bad out of the way, which is the noise. 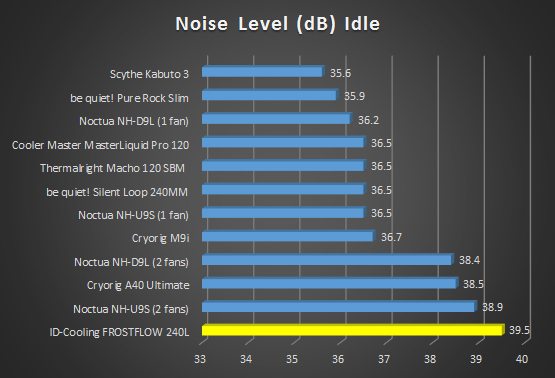 Unfortunately, this is by far the noisiest cooler I have tested. 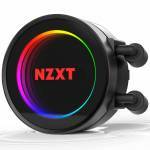 While still audible at stock idle speeds, the noise wasn’t too bad but once those fans kick in you’ll know about it and so will anyone in the room. 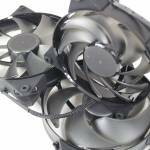 The fans are extremely loud, however, they do offer some great cooling performance. Now onto the good! 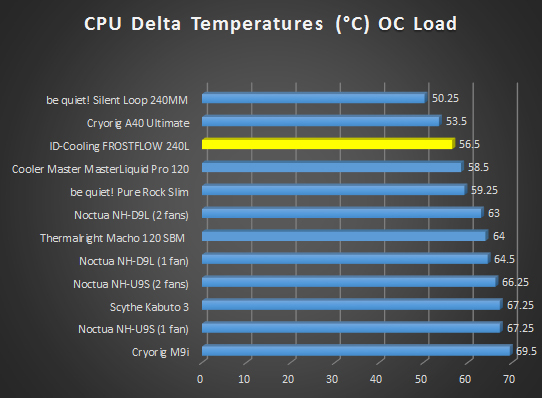 The cooling performance on offer from the Frostflow 240L is amazing. 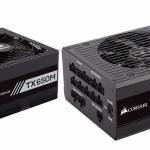 Yes, they’re are better 240mm AIO coolers out there but those will cost you a pretty penny extra. 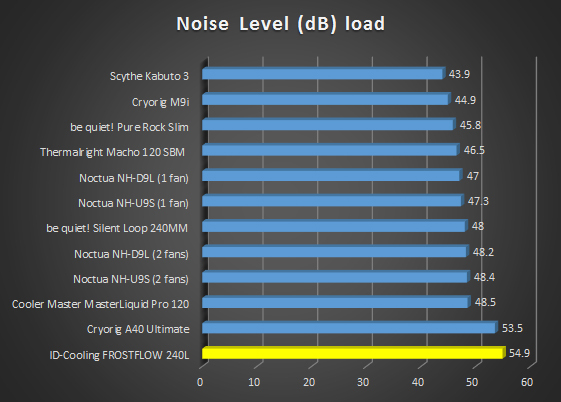 Albeit loud, the Frostflow 240L had no trouble at all keeping an overclocked 6700K well within respectable temperatures with plenty of room overhead! 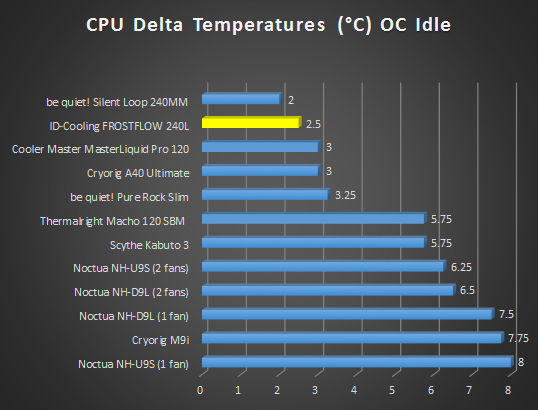 ID-Cooling must have done something right in the design department to get such good performance out of their Frostflow 240L. When it comes to the aesthetical side of it all, the cooler is also quite easy on the eyes. 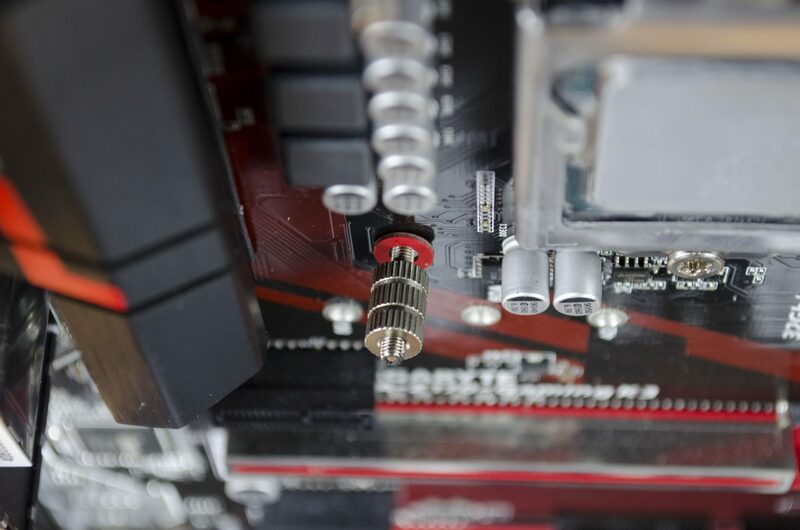 While there is currently no RGB version, you do have your choice of a few different colours for the LEDs on the pump. Aside from that, the sleeved tubing used goes over very well with me as it really does add that extra bit of quality to the overall package. 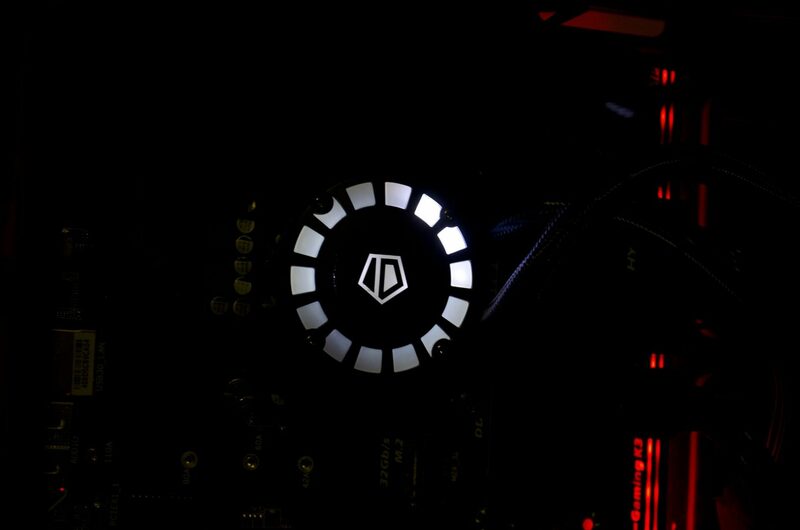 It’s also worth remembering the fans have removable rings and while extras aren’t included, they could be easily painted to match your system, though the LEDs may be a bit harder to change but not impossible. This is where it all comes together for ID-cooling’s Frostflow 240L, the competitive pricing. 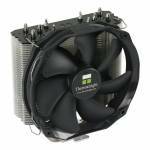 While there are a few other coolers on the market that are similar, they generally cost a fair bit more to purchase. 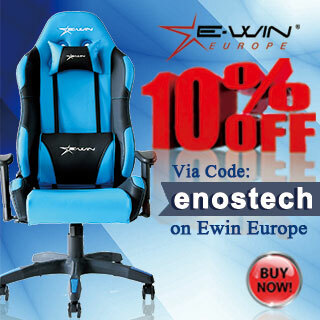 If money is no object and you are looking to shave off as many degrees as possible, then, by all means, go for the more expensive AIO’s out there. If you’re looking for something that offers a great price to performance ratio than the Frostflow 240L is certainly a good choice. For around £73, you are getting a great AIO with some impressive performance which also looks nice as well, making it a very smart purchase. 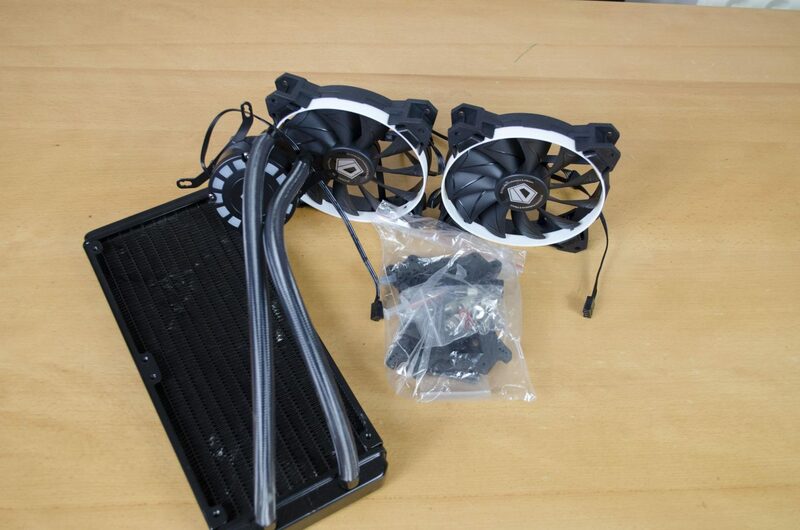 Many thanks to Beyond Tech for sending in today’s sample for review on behalf of ID-Cooling! 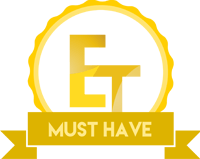 Want to discuss this review further, head on over to the ID-Cooling Frostflow 240L thread, in the Enos Tech Reviews Sub-category on the Gaming Exodus forums!